Celebrated for the first time in Summer of 2017, Comedy Feast is a multi-day comedy festival coupled with a food and drink festival. 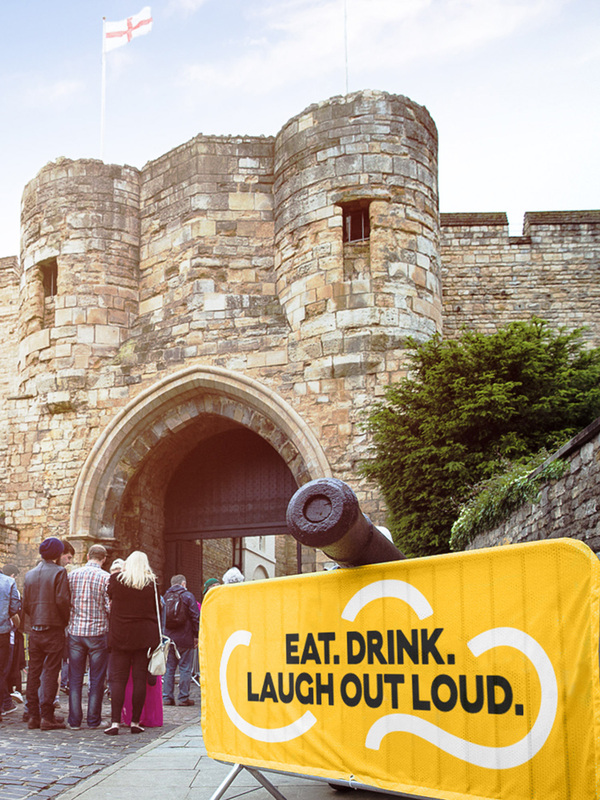 The first edition took place at Lincoln Castle in Lincoln, England — some photos here — and due to its success, more Feasts across the UK are being planned for 2018. The identity for the event has been designed by Manchester, UK-based Only. The logo is a simple pleasure, an easy to decode visual play that, unless you are dead inside (or are obnoxiously hard to please), should bring a smile to your face — doesn’t have to be a big smile, a small smile will do. Bending the “T” into a smile is charming and clever but you could also see it as having a bit of an edge given how typographically distorted the “T” actually gets. The font chosen — a customized version of Schick Toikka’s Krana Fat — has the right personality to deliver the punchline with a sort of deadpan aesthetic. 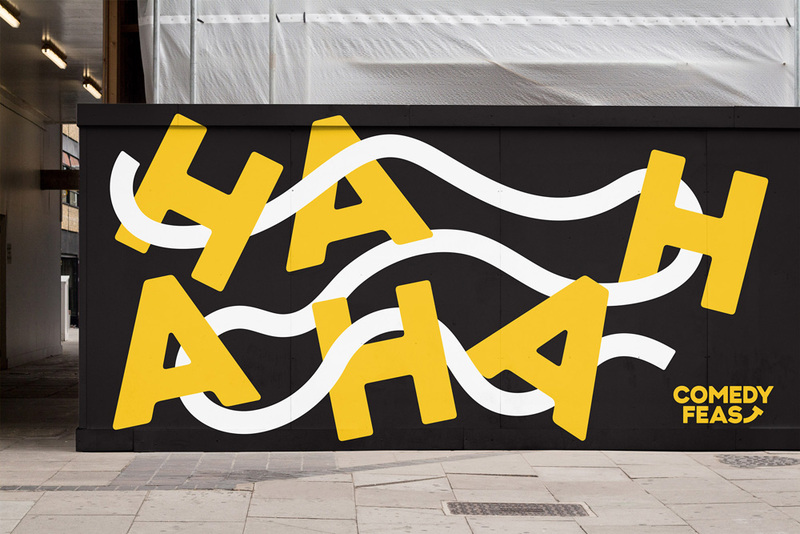 The visual language for the festival has a fun combination of being loose but also kind of uptight through the mix of the thick squiggle line paired with the stiff-looking letters that even when rotated wildly look like a business person in a suit trying to laugh. But maybe I’m reading too much into it. 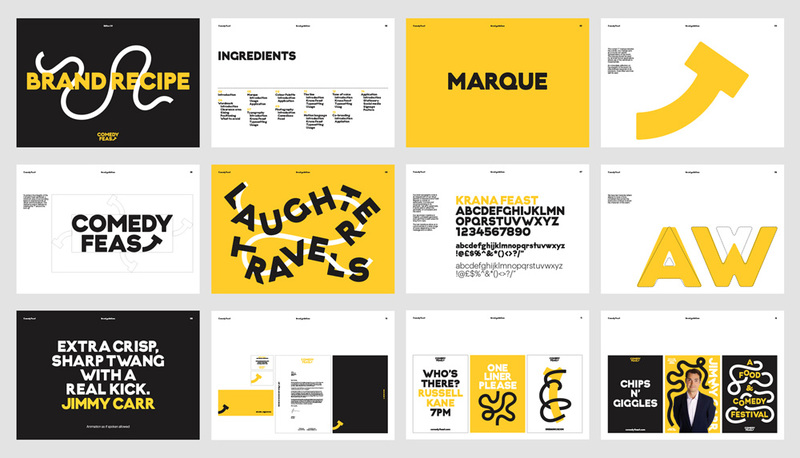 The fonts are big, the lines are thick, the colors are bold — it’s hard to not to like it. 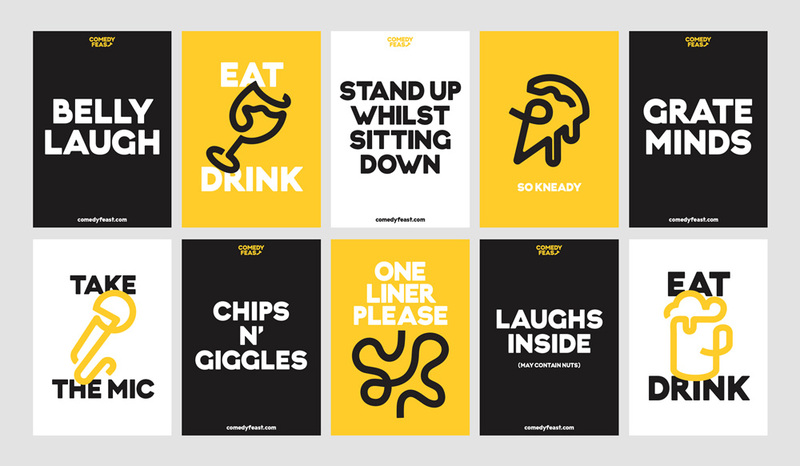 For a comedy festival, though, the copywriting and visual puns on the materials are not exactly the funniest — except for the pizza slice that says “so kneady”. Overall, this hits the right tone and has a number of visual expressions to sustain an identity for multiple events where it can feel varied but not entirely repetitive. 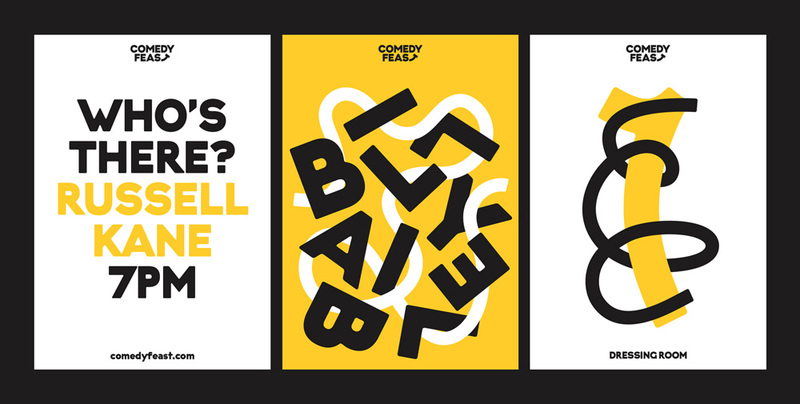 Celebrated for the first time in Summer of 2017, Comedy Feast is a multi-day comedy festival coupled with a food and drink festival. The first edition took place at Lincoln Castle in Lincoln, England -- some photos here -- and due to its success, more Feasts across the UK are being planned for 2018. The identity for the event has been designed by Manchester, UK-based Only.